Woolmer, 58, died on Sunday after collapsing at his hotel hours after Pakistan's World Cup loss to Ireland. Deputy commissioner Mark Shields said there was "now sufficient information to continue a full investigation". That investigation will be "into the circumstances surrounding the death of Mr Woolmer which we are now treating as suspicious," added Shields. There has been considerable speculation about the cause of Woolmer's death. Shields was asked directly at his news conference whether Woolmer was murdered, to which he responded: "No, we're not saying that." Asked if it was suicide, Shields said it would be "inappropriate to comment further at this time" as the police were still waiting for the final pathologist's report. Shields added: "It's the old adage - we have to keep an open mind and that is exactly what we are doing. We are conducting an investigation. "It means that any sudden death will be treated as suspicious until we can show otherwise and that is what we will do. "When we get the results back from the pathologist we'll go to the coroner and then we can decide what to do next." The deputy commissioner said Woolmer's family, the Pakistan team management, the Cricket World Cup and the International Cricket Council were being "kept informed of the ongoing investigation". Woolmer's wife Gill has told an Indian news station she had received an email from him on the morning of his death. She said: "He did mention that he was really depressed and could not believe how this could have happened." 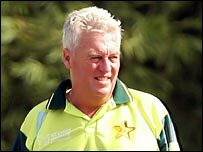 Pakistan's final World Cup group match against Zimbabwe went ahead on Wednesday after a minute's silence as a mark of respect for Woolmer. When the investigation is completed, Woolmer's body will be taken back to his home in Cape Town, South Africa, accompanied by team trainer Murray Stevenson. Pakistan Cricket Board spokesman Pervez Mir told a news conference that further investigations were being carried out by medical experts. "Obviously 'suspicious' could be anything at this moment," Mir said. "It could be something serious, it could be something not serious. We have a man who is down and we don't know the reason why." Woolmer, who appeared in 19 Tests for England during his playing career, had diabetes and there were reports he had recently complained of breathing difficulties. Woolmer enjoyed great success as a coach in county cricket, winning four trophies in two seasons with Warwickshire, and also coached South Africa.